I'll be back to this post when I am awake. i enjoyed watching and listening to your annotated practice video - i can imagine the time it takes to create your videos, thank you for sharing them. beyond the videos, you have amazing talent playing and teaching! 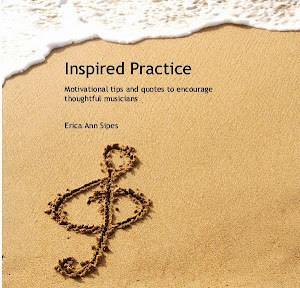 Thanks so much for sharing your approach to learning a new piece. It helps me to watch you actually doing it. Erica - It's very interesting for me to consider your practicing. First of all, because you say you love doing it! That's great, but probably pretty unusual. I think most musicians enjoy making music with others, planning and giving performances, and hearing the applause of audiences...but solitary, work-on-what-you-can't-do practicing?! Not that intrinsically motivating to most people. But I think back to your blog post of a few weeks ago about applying video games to practice. With that in mind, it's becoming more clear to me how you make practice so appealing. You're creating challenges for yourself, testing out approaches, even developing systems and formulating principles about music and learning. Practicing becomes more than practicing. It's more like an obstacle course or a scavenger hunt! It's really quite impressive. Thanks for sharing this! It's fascinating to me. Your reaction means so much to me. I think you have put two-and-two together in regards to my love of practicing better than I could have ever done myself. That's not all that surprising considering your background and incredible understanding for the mind in relation to musicianship. Thank you for your feedback and your insight, Bob. I'm thankful to have met you! Thank you so much for taking the time to create this videos! I think you already saw my blog post about them :-) This embodies everything I have tried to preach to my students about effective practicing and it has been wonderful sharing these videos with them. And you motivated me to sit down and learn some music too. It is great to remember that even with limited time, we can make meaningful music! Love this! I'm a viola player and have heard many a viola student practice as well as myself but it is a mind altering experience to listen to - and see - an experienced professional pianist practice! We do so many things alike and we do some things differently but I have to say that seeing the section of music and listening to your approach is a marvelous, wonderful peek inside your head. and for the kind feedback! Your words mean a lot to me because you have picked up on something I am learning to hold very close - simplicity and time that isn't divided between a million and one distractions. Sitting down to practice in a focused and peaceful way is something I look forward to every day because that type of focus also brings great results and confidence. I hope that you do continue to give yourself those opportunities as well!